Nothing warms like a big, steamy bowl of soup. Add a thick slice of buttered rustic bread and you’ll have a real winter favorite. 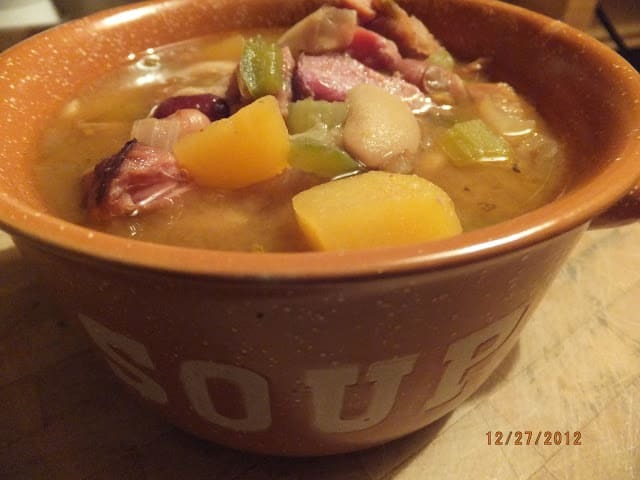 bone Old fashioned ham bean soup is made the old fashioned way with a left-over meaty ham bone or smoked ham hocks. About twice a year we make a ham with the ‘bone in.’ If I don’t get a chance to make ham and bean soup right away, I freeze the meaty ham bone for an afternoon when I have time to make a big pot of soup. 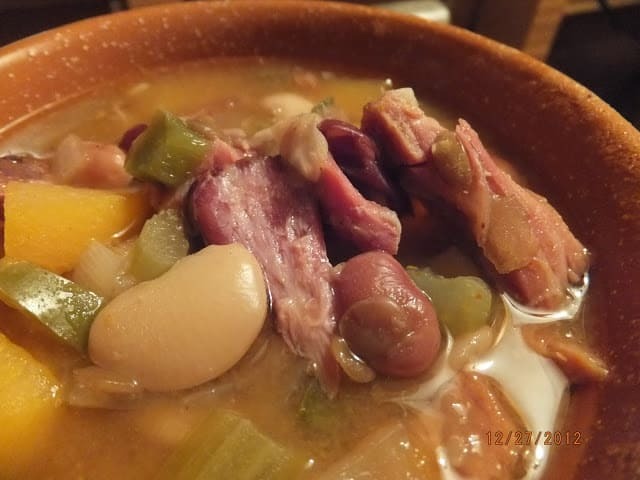 Old Fashioned Ham Bean Soup is packed full of good for you vegetables and beans. Made with delicious root vegetables like onions, carrots, potatoes and my soup favorite, the somewhat forgotten rutabaga. Another somewhat forgotten root vegetable that adds great flavor to any soup, is the lonely parsnip. Root vegetables are great to use in soup because they can withstand hours of long cooking that adds flavor to all soups. For as long as I’ve been making ham and bean soup, (which is a very long time) I’ve been using Hurst Brand beans. In fact, I think the original recipe was on the back of a package of Hurst 15 bean mix. I’ve added to the original recipe over the years, adding more vegetables, but other than that the recipe is the same. I’ve never used the seasoning packet that comes with the dried beans but if anyone out there has, let me know what you think. Here at Turnips 2 Tangerines we love our soup! To find more soup recipes look through our Recipe Box or make Cheesy Broccoli Soup to warm you up. 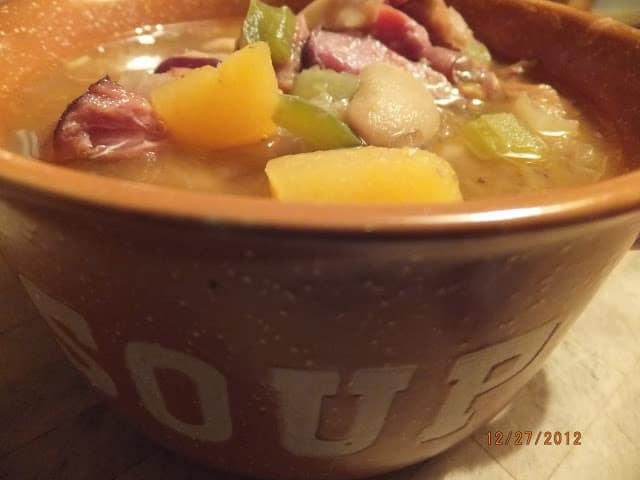 A delicious and hearty old fashioned ham and bean soup. Place dried beans in a large pot. Cover with 2 quarts water. Allow beans to soak overnight. After soaking, drain water, rinse beans. 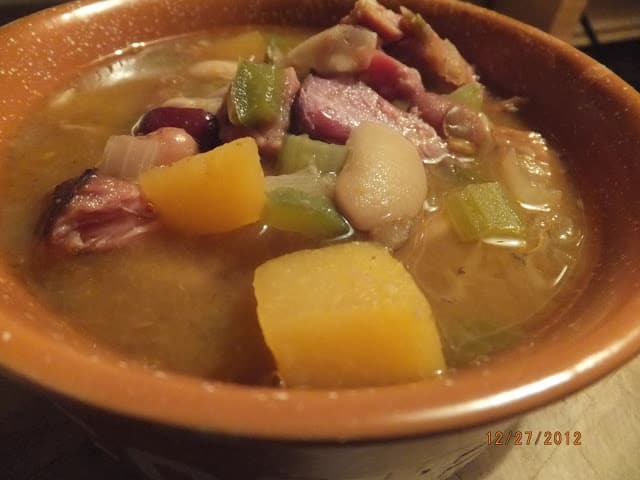 Place soaked and rinsed beans in large stock/soup pot, add ham hocks and water, bring bean/ham hocks to a boil, reduce heat, simmer uncovered for 2-1/2 hours. Remove ham hocks, cool. Remove meat when cool enough to handle. Add to the stock/soup pot onion, green pepper, garlic, celery, carrots, rutabaga, diced tomatoes, lemon juice, chili powder, hot sauce, liquid smoke, salt, pepper and ham. Return to a boil, reduce heat. Simmer for 1 hour or until vegetables and beans are tender. looks yummy! so glad I stumbled upon your blog! new follower! I'm so glad you found me! I stopped by your blog, and I not only love and own antiques, I have 4 pugs!! new follower!